Greetings from the Burgh, where Payday Senior Labor Reporter is finally regaining strength and stamina after a two-week battle with strep throat. Folks, thanks for all your help with the Paid Sick Day Fund, where we raised $1,254. So far this month, Payday’s fundraising is going strong as we have raised $537. Help keep us sustainable. Sign up to become a sustaining recurring member today, which allows us to focus more on reporting and less on fundraising. 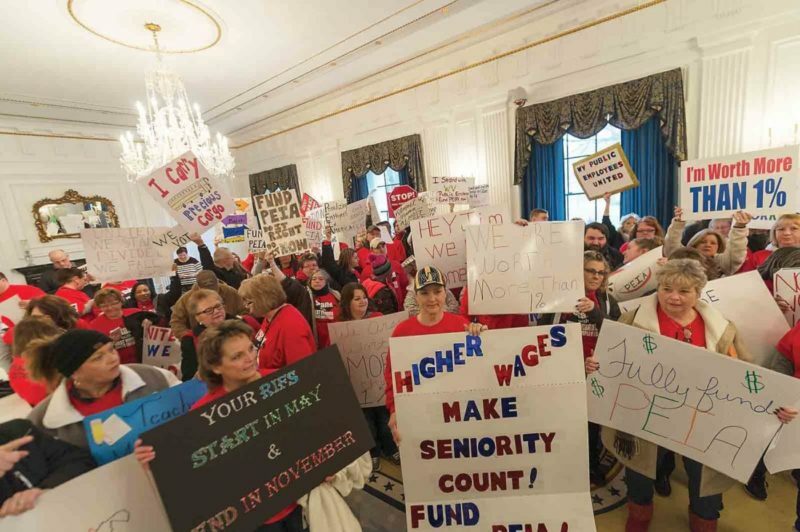 Last week, hundreds of teachers throughout Southern West Virginia went out on strike and stormed the State Capitol demanding pay raises. On Wednesday, the State House passed a deal instructing the state health insurance plan to hold off on freezing health care rates for the next fiscal year and giving them 1% raise. It’s unclear if strike actions across the state will continue. The union plans to gather this weekend to vote on whether or not to strike statewide. Black lung was thought to be a problem that was decreasing. However, in recent years, incidence rates have increased after mining techniques changed when coal operators began digging for tougher-to-mine coal. “This is the largest cluster of progressive massive fibrosis ever reported in the scientific literature,” says Scott Laney, a NIOSH epidemiologist involved in the study. Major League Baseball players and their union are accusing Major League Baseball of engaging in collusion this offseason. More than 100 players so far haven’t been signed this offseason. More shockingly, the amount of money spent by Major League Baseball on free agents has dropped precipitously. The Washington Post reports that only nine players have signed contracts of three or more years this offseason, compared with 27 a year ago. Meanwhile, total spending on free agents this winter is $780 million, compared to $1.45 billion during the 2017 offseason and $2.53 billion the offseason before that. The union is currently considering legal action and could bring a charge of collusion against Major League Baseball. If an arbitrator found that Major League Baseball colluded, then the current collective bargaining agreement, which expires in 2021, would be null. This would give the players the right to strike if they so choose. With so many players unsigned, the Major League Players Association intends to open their own spring training camp in Bradenton, Florida for unsigned free agents to train in the hopes that teams will sign them. #TBT The Ringer has a look at when the Players Union hosted its own spring training camp in 1995. A bill moving in the Kentucky State House would cut unemployment benefits from 26 weeks to 14 weeks. Additionally, the bill would impose a new salary minimum of $2,000 that workers would need to make in order to be eligible for benefits. The bill would also cap increases in unemployment benefits that were meant to increase with inflation. The bill has the support of Kentucky Governor Matt Bevin as well as State Rep. Phillip Pratt, who chairs the committee that will hear discussion about the bill. Pratt says he is sponsoring the bill in order to lower unemployment insurance premiums and entice more businesses to relocate to the state. Kentucky AFL-CIO President Bill Londrigan rejected the idea that businesses won’t move to the state because of high unemployment insurance benefits. #PA18’s Conor Lamb Clarifies Position on Dream Act & Calls for Increased Border Security. This week, Nancy Pelosi made history when she gave an 8-hour long speech on the floor of the House in support of the DREAM Act. When pressed for comment as to how Conor Lamb felt about the Dream Act, Lamb’s Campaign Manager Abby Murphy declined to support a Clean Dream Act without funding for border security. “Conor has said he supports a legal path to citizenship for Dreamers, and he supports more funding for border security. Most voters agree and don’t see why we can’t have both,” said Murphy. Organizations such as Unidos, Indivisible, and the AFL-CIO have championed a Clean Dream Act without funding for a border wall. Immigrant workers do most of the dangerous work of cleaning and cutting meat in poultry factories. Last month, workplace safety advocates celebrated the defeat of a proposed USDA rule that would have eliminated the maximum speed at which assembly lines can operate. The movement to organize adjuncts in Florida is growing. In late 2016, more than 1,000 Hillsborough Community College adjuncts voted to unionize. Then, in December, 1,700 adjuncts voted to unionize at Broward. Now, the Public Employees Relation Commission has granted adjuncts at the University of South Florida the right to vote in a union election. Voting will occur from February 16th to March 13th. People also don’t know that my aunt went through a lot of financial hardships after what happened. She had health issues and developed ulcers and couldn’t afford the medication. She didn’t get real, stable work until 1957 when her brother, my Grandfather McCauley, convinced her to move to Detroit. She sacrificed her privacy, her job, her marriage, her health. She never talked about that with people, though. She just didn’t want to burden people or make them feel sorry for her. Go to Shondaland to read the full story. What was most in my mind when I wrote this book regarding communities of color is that in the coalfields of Appalachia in southwestern Virginia and eastern Kentucky and southern West Virginia at various points in time — particularly like in the 1910s and 20s — these are some of the most diverse places in the country. You have an influx of recent European immigrants. You have poor people who have been in the region for maybe a generation or two. And then you have a huge influx of imported African-American labor from the South. These really diverse areas existed and persisted in Appalachia. So some of the places that journalists were describing as the beating heart of Trump Country were also places that were maybe 50 or 60 years ago the most diverse places in Appalachia. Of course, they’re not like that now. But I found it very interesting that nobody was telling that story, too, to talk about why don’t people of color still live in these communities. Spoiler: It’s often because when the first round of of labor layoffs and firings happen it’s people of color that are targeted along with white women. But I really am appalled at this idea that travels through narratives of Appalachia and Trump Country that rural places are naturally white places, because that’s never true. Why they come to be and why we imagine them to be can tell us so much about the complexities of how our country developed and how we have arrived at this moment. And anytime we have a chance to push back against the narrative that naturalizes any particular geography or place or state or way of life as the dominion of white people I feel that I need to take the opportunity to do that. — Atlantic Science Writer Ed Yong did a study of two years of his reporting and discovered that he was only quoting women about 24% of the time and that 35% of his stories featured no women at all. Check out Yong’s piece on the steps he took to correct this problem and what we should do all be doing as journalists. Have you heard about that time in the late sixties when three student protesters were shot dead by state troopers? No, it wasn’t Kent State, in May 1970, when four white students were killed by the Ohio National Guard. Nor was it Jackson State, eleven days later, when two black students were killed by Mississippi police. This was in Orangeburg, South Carolina, two years earlier, and it was in many respects a watershed moment: it marked the first time in U.S. history that students were killed by police on their own campus, according to sociologists Charles Gallagher and Cameron Lippard, and it presaged the ruthlessness with which the state would repress the rising Black Power movement in the months and years to follow. Yet, in the words of a 2008 New York Times article, the incident “never pierced the nation’s collective memory of the 1960s.” Amid so many tributes to the events of 1968, we would do well to remember it today. On February 8, 1968, in the college town of Orangeburg, state troopers and police shot into a crowd of African-American activists, killing three and wounding twenty-eight more, in what came to be known as the Orangeburg massacre. The murders of Samuel Hammond, Henry Smith, and Delano Middleton at the hands of the police was a stark reminder of the limits of the civil rights movement’s gains. It also forced a meditation on how far the South—and the rest of the nation—still had to go in terms of both implementing the letter of the law on civil rights and respecting newfound racial pride among African Americans. — Finally, Georgia Public Radio has a long interview with Rutgers University History Professor Melissa Cooper, author of “Making Gullah: A History of Sapelo Islanders, Race, and the American Imagination about the misconceptions and stereotypes of Gullah culture in the Sea Islands off of the South Carolina and Georgia coast. 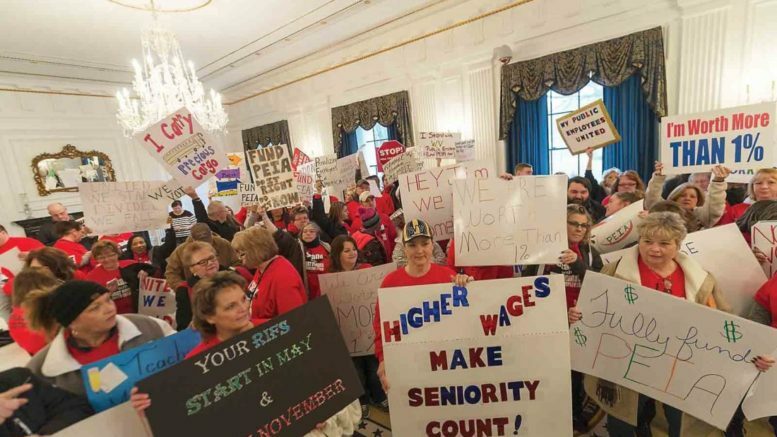 Be the first to comment on "WV Teachers to Vote on Strike – Lamb Talks Dream Act in #PA18 – Baseball Player Labor Dispute Heats up"